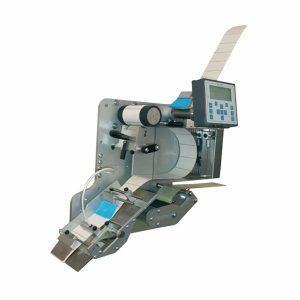 The ALS FastPaQ Series of high-speed label applicators have been designed with flexibility and ease of use in mind. Their extensive features and compact, modular design make them suitable for a wide variety of high-speed applications. Advanced speed matching – allows accurate labelling through extreme product speed changes and production stoppages – avoid lost product through inaccurate labelling every time the production line is stopped or started. Store previous set-ups and instantly recall the settings for multiple label/product combinations. Automatic missing label compensation – avoids unlabelled product. Detailed message and help functions. Tandem Operation – Two machines working together, each with large 400mm OD rolls; when one runs out, the other takes over. Fan-Folded Labels – splice the end of the box of labels to the start of the next box, on-the-run, with continuous vacuum extraction of the waste backing liner.